With Movie Edit Pro Premium you can bring even the most demanding video productions to life. Advanced users can profit from the huge selection of powerful functions, unique effect palette and tons of exciting new features. - Attention to detail: Special effects, dissolves, intros/outros, menus, etc. With travel route animations from MotionStudios, you can reconstruct every detail of your trip. Select a destination from over 80,000 cities, towns and villages in the GPS database. In addition, you can display up to 10 separate routes on one map. This way you can see exactly where you went on your last trip - and relive those memories in high-resolution 3D mode. Create high-resolution 2D and 3D titles in no time with NewBlue Titler Pro Express. Use one of over 60 templates included in the program or create your own headers and banners. You can then animate these simply by using drag & drop animations. 360 degree videos let you capture your experiences in a totally unique way. 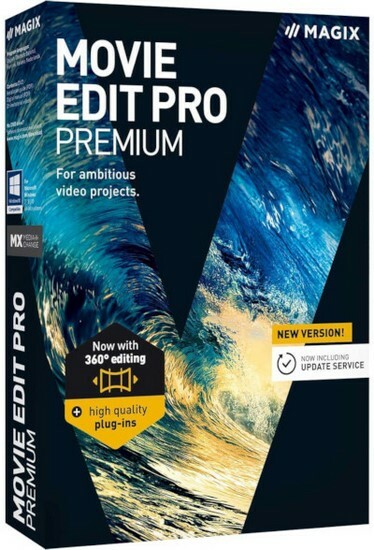 Movie Edit Pro Premium includes support for importing, editing and exporting 360� video recordings. You can also load your video to YouTube from directly within the program. The new shot match feature enables you to match the colors and tonal values of separate scenes automatically. Shot match is perfect for outdoor scenes, where weather and lighting conditions can change quickly. You can now use OpenFX standard plug-ins as a video effect from directly within the media pool. Share your experiences and memories in HD quality with your community on Vimeo. Use one of the five new video effects - for fantastic highlights in your videos. - ShiChuang 10, ShiChuang 8.1, ShiChuang 8, ShiChuang 7.